Yamaha FreeGo adds a variant of the Yamaha Indonesia product to the category of 125cc automatic scooters. The new scooter was presented by PT Yamaha Indonesia Motor Manufacturing (YIMM) at the Indonesia Motorcycle Show (IMOS) 2018 at the Jakarta Convention Center (JCC) on Wednesday (31/10/2018). Yamaha FreeGo is equipped with a 125cc Blue Core engine equipped with an intelligent engine generator (SMG) that makes the sound of the starter more fluid. The technology of the Start Stop system is also associated with the engine. The engine's legs are supported by 12-inch diameter wheels wrapped in 100 / 90-12 size tires at the front and 110/90 at 12 back. The suspension is nothing special, using a telescopic fork on the front wheel and a single suspension for rear damping. The main aspects highlighted by Yamaha FreeGo, a question of functionality and comfort. Under the seat is a 25-liter bag, larger than the 25-liter NMax storage. As a result of optimizing the size of the luggage, Yamaha moved the fuel tank on the front axle, such as the Yamaha NMax and the Aerox 155. In addition, the tank fill hole was placed on the table. top edge. "It makes it easy for us, often we get consumer feedback when they want to refuel, they have to open the seat, lower the luggage first, then refuel." In FreeGO, we offer the the convenience of refueling (tank hole) in the bow, "said PT YIMM Marketing Manager Yordan Satriadi. The meter table uses a digital speedometer equipped with engine control indicators, a start-stop system, fuel level, etc. The main light uses LED light. 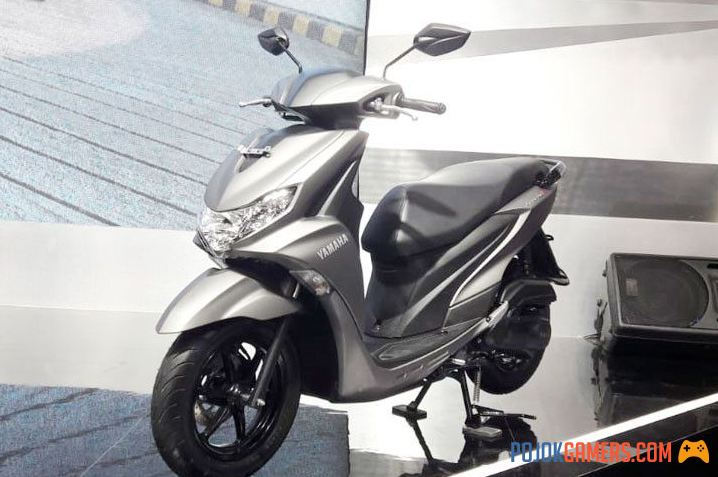 Yamaha FreeGo comes with three level of finishing options. FreeGo Standard, FreeGo S and Free Go S ABS. Yamaha FreeGo S and FreeGo S ABS benefit from additional smart system features that work without key children. Each is priced at IDR 18.5 million (standard type), IDR 19.7 million (Type S) and IDR 22.5 million (Type S ABS). Yamaha Indonesia said the new scooter was mass-produced. Therefore, the device is available from the Yamaha network. Yamaha Indonesia believes that the presence of new Yamaha FreeGo 125 scooter products does not interfere with Yamaha Lexi's market in the 125cc automatic scooter segment. Because both have different characteristics and characteristics. PT Yamaha Indonesia Motor Manufacturing (YIMM) executive vice president, Dyonisius Beti, said FreeGo 125 was designed as a functional motorcycle. The characteristics of the motorcycle facilitate the transport of luggage in the trunk and on the front deck. FreeGo 125 has luggage capacity of 25 liters. Yamaha describes that luggage can load items such as a backpack, a full-face helmet and gloves. In addition, place the tank under the deck with a fill hole on the dashboard for easy loading. According to Yamaha Indonesia, consumers often struggle to refuel when they carry a lot of goods in their seats. Another feature that facilitates everyday activities is the power socket located on the right dashboard. This device can be used to charge a mobile phone. The striking difference between FreeGo 125 and Lexi, which concerns the appearance of the bike. FreeGo has a compact scooter face, while Lexi displays a glamorous feel with a Cruiser-style driving position. In terms of dimensions, the difference is also quite striking. One of them is marked by the size of the wheel. FreeGo 125 uses 12-inch diameter wheels, while Lexi offers 14-inch alloy wheels with wide tires. In short, Lexi highlights the beauty of design, while FreeGo 125 is a motorcycle hunter geared to everyday mobility. For this reason, Dyon estimates that both products have different market shares. "Lexi is (series) Maxi, (FreeGo), it's the best automatic in its category, the market segment is different." said Dyon.